Centralize and access important information with your Home Screen. You choose the different icons to add to the grid. The following explains the different components of information that are available. See Home Screen for a complete overview of how dashboards work and how to create, customize and manage them. Select your icons in the Customize link in the bottom left corner of your Home Screen. Your organization may not use all the items listed. 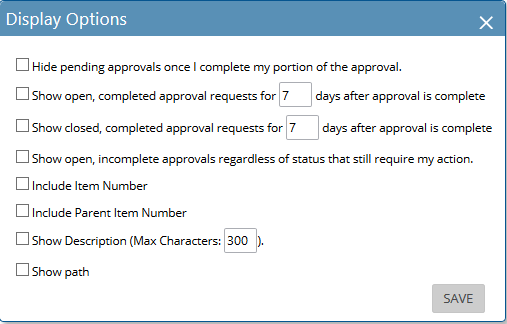 Hide pending approvals once I complete my portion of the approval - if there are multiple approvers, check this option to hide those approvals that you have completed (either approved, denied or skipped), even though there are other approvers from which action is still required. Leave it unchecked to see the approvals that you've completed but other approvers haven't yet completed their portion (in that case, the approval is listed, but you won't have any Approve/Deny capability because your portion is completed). Show open, completed approval requests for # days after approval is complete - There are two separate life cycle states for an approval. Open/Closed and Pending/Approved/Denied. An approval can be approved or denied but still be open because the originator hasn't yet closed it. If checked, this option shows open approvals that have been approved or denied (i.e. completed) if their date falls within the number of days set. Show closed, completed approval requests for days after approval is complete - This is the same as above except it shows the approvals that were formally closed. 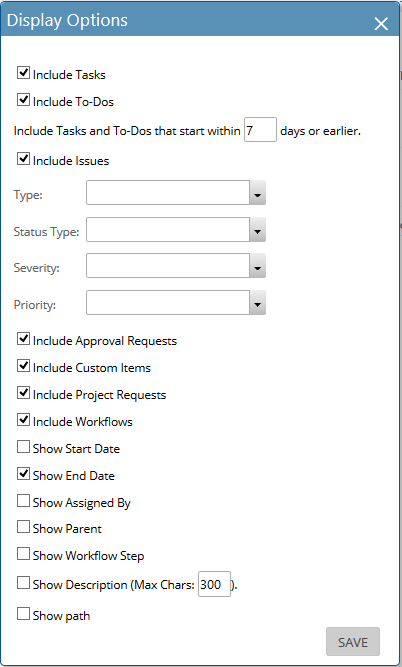 Show open, incomplete approvals regardless of status that still require my action - If there are multiple approvers and one of the approvers denies the request, the entire approval gets set automatically to be denied even if the other approvers have approved it or it is still pending for them. Check this option to see those types of requests, where they were denied by someone else even though you haven't reviewed the approval. Show open, approval requests that are denied - these show all open requests that have a status of denied. No matter whether you denied it or someone else did. 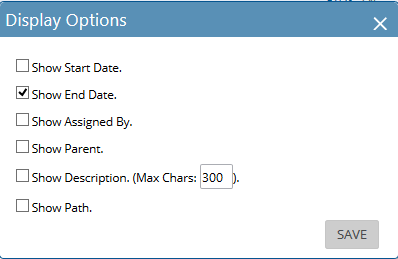 The rest of the option designate whether or not you want that detail to appear on the component list. Expense Reports is a list of expense reports which are pending action. These will include reports you have submitted and those which need approval by you (if you are an approver). If your team uses Custom Items, you will see the items name next in the Customize list. Your administrator will have more information about when to use these Custom Items. 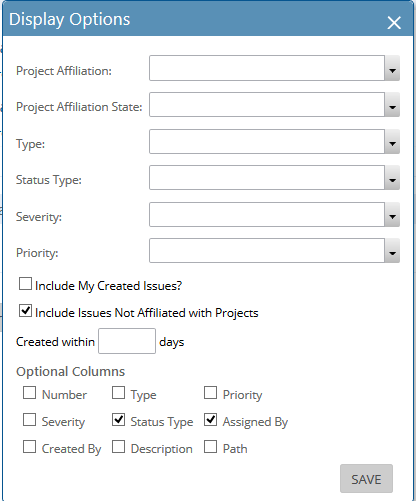 Notifications will display all notifications, it will default to showing the latest 25 notifications that were sent to the user via Auto-Alerts that have been configured by System Admin or scheduled reports that were configured to be sent via "Online". At the bottom of the first set of 25 notifications a user can click more to get the next 25 notifications and then the user can continue to click more to get an additional 25 notifications each time. Currently it will display all notifications to the user regardless if the user has already viewed the notification or not and sort of the notifications is always latest to oldest. 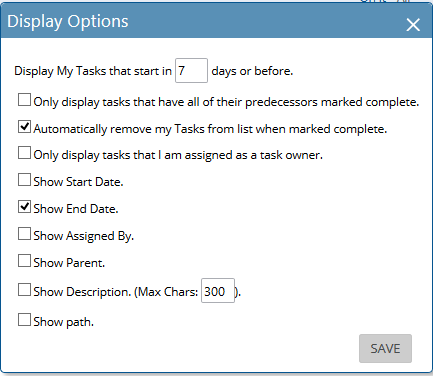 Dashboard - Tasks Tile is a list of tasks assigned to you within various projects. 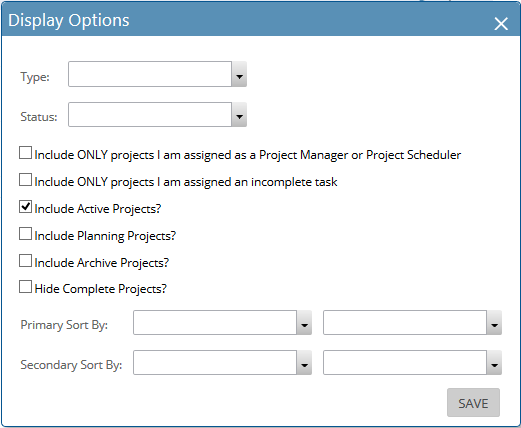 Options for Tasks include the ability to control the number of calendar days from now within which scheduled start date tasks will display. For example, you may only want to see tasks on the list which are scheduled to start within the next seven days. 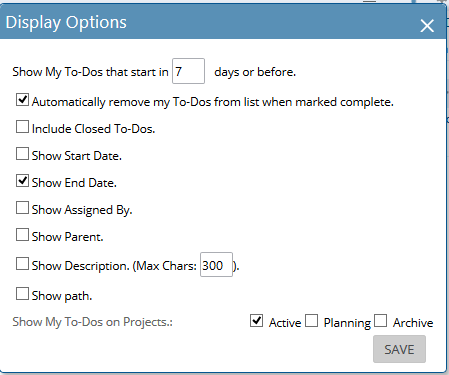 Time Sheets is a list of time sheets which are pending action. These will include reports you have submitted and those which need approval by you (if you are an approver). Once you have added your desired icons, you can drag and drop those icons to change their position on your Home Screen.